The first course of its kind in Lebanon helps neonatologists achieve mastery in the field. 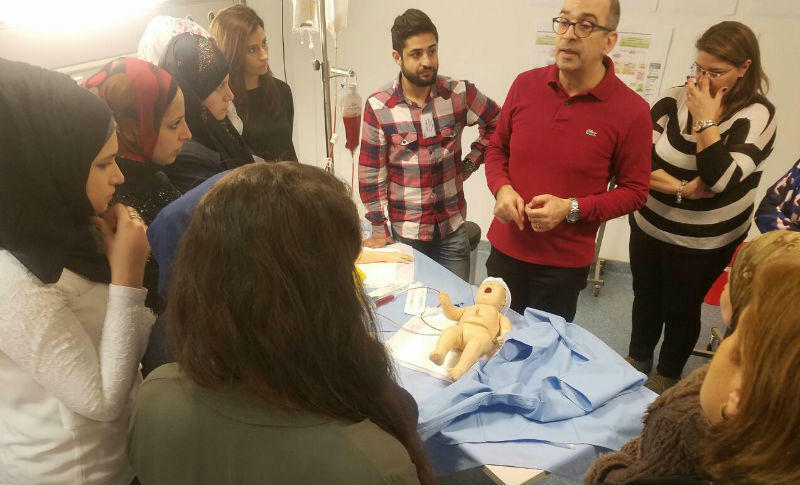 LAU’s Clinical Simulation Center hosted a two-day practical training course specifically targeting the management of neonatal and pediatric emergencies. The course is the first of its kind in Lebanon, and it aims to teach health professionals technical and non-technical skills through repetitive practice to mastery learning. Other LAU instructors present were Dr. Abeer Hani, a pediatric neurologist, and Dr. Krystel Malek, a pediatric anesthesiologist. The Clinical Simulation Center, housed in the Chagoury Health Sciences Center on LAU’s Byblos campus, features highly advanced replications of hospital environments. The center is outfitted with state-of-the-art neonatal and pediatric equipment provided by a grant from the American Schools and Hospitals Abroad program to provide the highest quality simulation experience. “High-fidelity models” are programmed to perform and respond as humans would in the center’s unique training scenarios, giving trainees a life-like experience and invaluable preparation.